1. What does Creative Birmingham mean to you? I grew up in Birmingham and when I was in high school, I dreamed of a city that had something going on in every nook and cranny. I craved creative energy and was anxious to leave Alabama to find it. Sixteen years later, I look around Birmingham and think, “I would have been happy, had this been my city in high school”. Creative Birmingham means the present to me. 2. You lived in Seattle for a while, what brought you back to Birmingham? I lived in Seattle long enough to call it home. Some of my very favorite people are still in Seattle. In fact, I cut my creative teeth on Seattle’s art scene. It definitely wasn’t “on purpose” that I returned to Birmingham (my path is full of oxbows), but I have surrounded myself with some of the most creative people to be found in Birmingham and I spend my days learning from them. It’s hard to remember what brought me back to Birmingham, but it’s easy to say what keeps me: the people, my family and Mrs. Annie Bryant. 3. You created an organization called Bib & Tucker, can you tell us a little about that? When I first moved back in 2010, I started a textile design company with my father called Tré Lilli. Eventually, I needed to figure out a viable and sustainable method of manufacturing. I was teaching sewing and I was sewing with a small group of women, meeting once a week at Inglenook Library. Mrs. Annie Bryant of Woodlawn and I would spend time talking after these weekly sessions and I told her my dreams of reviving some of the textile industry of our city in the form of a cottage industry of seamstresses. 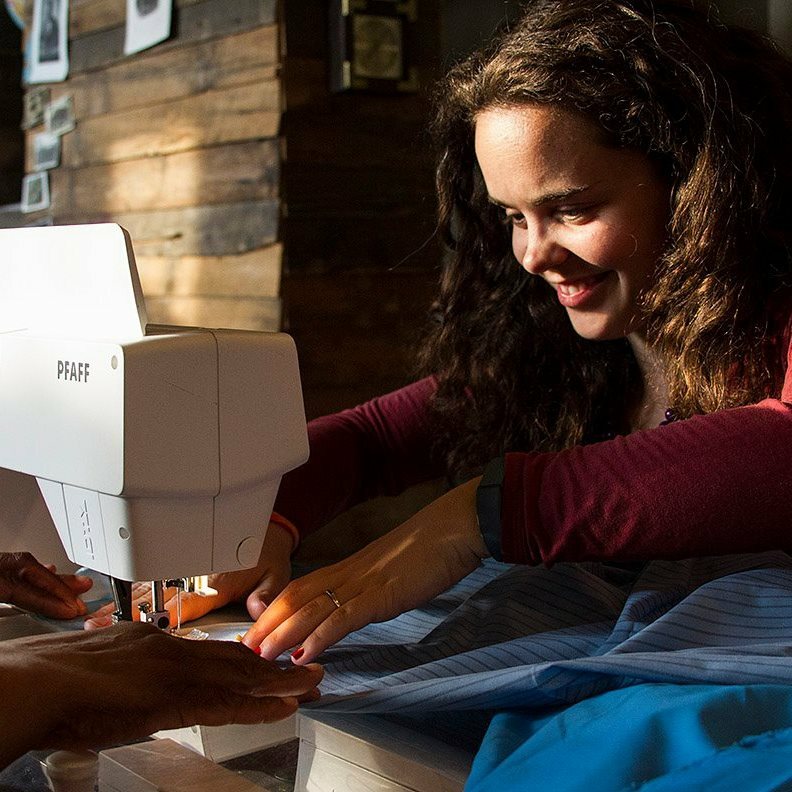 Mrs. Annie has been the biggest advocate of this dream and she and I co-founded Bib & Tucker Sew-Op. 4. What is your hope for the future of Bib & Tucker? Right now, the members of Bib & Tucker are a varied lot. Some of the women are expert seamstresses and some have never turned on a machine when they walk through the doors. We have retired women and women fresh out of college. We have varying income levels, experience and history, but we all have the common goal of strengthening our sewing skills within a supportive community. That is what Bib & Tucker currently is. What I hope is that we can become a cottage industry of manufacturers for local designers. I hope that we can develop programs to take into the schools that will teach math, history, English and design through quilting. I hope that we can be an incubator for designers who want to start their own businesses. I hope that we can be an umbrella for all of the incredible sewing artists in Birmingham. I also hope that anyone who learns about the Sew-Op and wants to visit or learn more will reach out. As Mrs. Annie says, “We never meet a stranger”. Anyone is welcome to become a member. 5. What inspired you to pursue textiles as an artistic medium? I have fought this dream all my life. When I was seven, my mother would purchase Bride magazines and I would fill them with color using my Pentel 64 color set of markers. I loved fashion and clothes and the idea of being a designer. I studied Industrial Design in college but spent more time in an elective costume design course than I did in the wood shop. During grad school, while pursuing a masters in China Studies, I designed robes for my father’s monks and traded library time for my watercolor set, conceiving new textile designs. To answer your question, I suppose it was the quilters of Gee’s Bend that ultimately inspired me to pursue this path. After visiting them, I started hand sewing and everything fell into place. But it’s been with me, this love of textiles, clothes, and design, since I was very young. 6. What would you like to see happen in Birmingham over the next 5 years? We have a textile history here. I’d like to see a rebirth of it with a strong focus on local, transparent manufacturing. Birmingham could be the antidote to New York’s sample houses. The crafting movement, DIY-ers, makers, and the like, have been raising the standard by which consumers determine the value of a locally made item. Consumers want to know the story behind the item they are purchasing, or they want to know how to make it themselves. I would like to see this movement grow in Birmingham and I would love to see this city become a hub for craftsmen and makers. It certainly seems to be on the right track.